If you’ve ever had to choose between attending an important meeting or your child’s ball game or dance recital, you are a SuperBusy Parent! Parent Coaching: A specialized form of life coaching exclusively for parents that helps parents be the best they can be in the multiple roles in their life. Parent coaching is for parents who want to raise happy, confident children and have fulfilling, successful and balanced lives themselves. It helps parents grow both as a parent and as an individual by providing confidential unbiased objective and compassionate help to clarify dreams and overcome challenges. Working Mom Coaching: Just as the rewards of being a SuperBusy Professional Mom are unique, so are the challenges. Whether you have been maintaining your juggling act for years or you have just recently become a working mom, a coaching partnership with The Priority Pro can lead to tangible solutions for being the best in both worlds, from management to motherhood and everything in between. Career Coaching: Designed to help you gain clarity and focus in your career. It guides you to develop a strategic plan to help weather a career transition, facilitate professional skill development to help you succeed on the job, transform your current career, and much more. Leadership Coaching: Everyone is a leader–either by choice or by default. 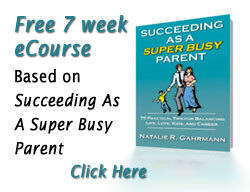 As a SuperBusy parent, at the minimum, you are a leader of your family and of your own life. Chances are you also wear many other leadership hats through the mulitiple roles and responsibilities you hold.